Découvrez l’une des principales attractions du Canada et dégustez des vins locaux raffinés lors de cette visite d’une journée aux chutes du Niagara, comprenant une dégustation de vins de Toronto. Après une prise en charge à votre hôtel de Toronto, partez avec votre guide en autocar vers la ville historique de Niagara-on-the-Lake. Profitez du temps libre pour faire du shopping et faire du tourisme, puis dirigez-vous vers Niagara Falls. Explorez la région à votre guise et émerveillez-vous devant la puissance impressionnante des chutes. Ensuite, visitez une cave pour goûter certains des vins qui ont fait la réputation de Niagara et pour mieux comprendre leurs saveurs et leurs arômes distincts. Our guide, Zeekee (not sure how it is spelled) was very helpful. I thought I had purchased the hornblower boat tour, which I did not. Zeekee helped guide me to where I was to purchase a ticket and waited for me so that I could catch up with the group. I would recommend the boat ride under the Falls. Loved it. Informative and pleasant driver. Trip was enjoyable. Got to see a lot of Toronto as we rode on the bus so the trip was definitely worth it. Loved this excursion! Tour guide was very knowledgeable and nice too! Great day out, very relaxing, an opportunity to see countryside out of Toronto during bus journey. Wine tasting was good. The Falls were exactly as the photos suggest. Ignore the tacky tourist stalls, concentrate on the natural wonder, and do have a go on the 'Maid of the Mist', be prepared to get wet! Fab day away from an intense city break. Excelente el conductor guía, Michael, un hombre agradable que hace todo por facilitar el viaje. I was a bit disappointed with this tour. The wine tasting only lasted about 15 minutes tasted three wines, the boat tour and lunch were not included, which was not realized until the day off. The description makes it seem like the boat tour and lunch are include just for a heads up. If you do not book the boat tour and lunch separately, you will have 3 hours to find something to do solo. Our guide was very hard to hear so I didn't learn anything while on the ride. Overall, I wouldn't recommend going with a tour. 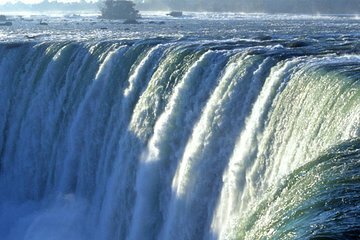 Instead book a bus ticket from Toronto to Niagara Falls, get a cheap boat tour ticket which are sold all over, and then head back. Total should be a 4 hour adventure. My tour lasted about 12 hours and it was way too long. Communication was non existent. I had to call 3 days after I booked my tour just to confirm if my tour had been approved and to confirm where I was getting picked up from and what time. There was also no winetour that it said was apart of the package which is the main reason I booked this tour. Very nice and organized trip. We first went to a Winery school that was beautiful and learned about/sampled some wines. We went next to take a quick picturesque view if the Niagara Falls from the top of the falls, getting a nice panoramic view of it all before we headed to a quaint lunch that was pretty good. Then we took an AMAZING cruise into the heart of the falls and felt the real power of the falls. As we dried off, we ventured into the quaint town of Niagara-on-the-Lake for some shopping. The tour guide seemed to be very knowledgeable and efficient. The tour did seem a bit rushed but all in all a wonderful experience!